Agriculture Secretary Tom Vilsack gave a big middle finger to the organic farming community last week, as his USDA gave unrestricted approval for GM alfalfa. But the Secretary (if I may coin a term) Vilsacked that proposal and gave agro-behemoths like Monsanto totally unrestricted approval to blanket the U.S. with GM alfalfa, which is genetically engineered to resist prodigious amounts of Monsanto's Roundup pesticide. This flies in the face of the pledge for “co-existence” he called for in the weeks leading up to the decision. Why sack the modest restrictions meant to protect the relatively small and vulnerable organic farming industry from the Pandora's box of GM crops? 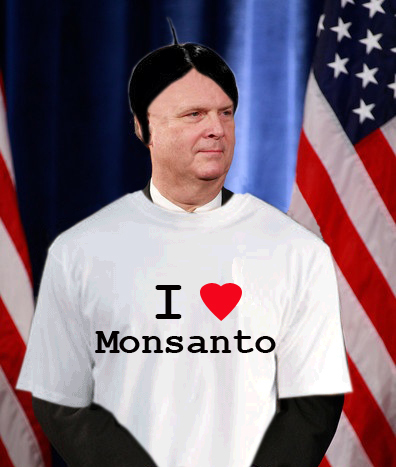 Vilsack has always been a darling of big-agriculture — Monsanto especially. When he was Governor of Iowa, he was even chauffeured around in a Monsanto private jet! He's also been a cheerleader for the bio-tech industry, receiving the Biotechnology Industry Organization's (BIO) "Governor of the Year Award" in 2001. So it was no surprise that BIO President Jim Greenwood cheered the most recent decision, telling the Wall Street Journal, "we hope this will help pave the way for new technologies in the pipeline." Other media outlets have implicated the Obama administration in strong-arming Vilsack into nixing any restrictions on planting GM alfalfa, as Tom Philpott points out at Grist. The WSJ reported the Obama administration had been reviewing all government regulation to "weed out" any proposals that are burdensome to businesses, and that the alfalfa decision echoed a larger initiative to restore Obama's credibility with business leaders. Now, correct me if I missed something, but aren't regulations intrinsically burdensome? Even toothless regulations should involve some sort of pressure! Even David Axelrod weighed in on the issue at a White House meeting, telling those in attendance to “plow forward” on the genetically produced alfalfa issue, according to Maureen Dowd. Alfalfa is the fourth largest crop in the United States acreage-wise, and serves mostly to feed cows and horses. In the meantime, the Center for Food Safety (CFS) is seeking to fight the decision, claiming the USDA's environmental impact statement was inadequate. “We’re disappointed with USDA’s decision and we will be back in court representing the interest of farmers, preservation of the environment, and consumer choice” said Andrew Kimbrell, CFS's Executive Director said in a press release. Green Chip Living Contributor Brigid Darragh details the Supreme Court battle between the Center for Food Safety, organic farmers, and non-profits vs. corporate chemical king Monsanto. Monsanto has topped this year's Corporate Hall of Shame... Cast your vote!